We fully expect PPG to make a hostile bid for Akzo following the abrupt and somewhat arrogant rebuttal that PPG received this last week-end. Akzo’s long-term and deeply imbedded optimism – Exhibit 1 – show that the management has little grasp of what is in the best interest of its stakeholders, including the management team itself. There are limits to any legal protection, especially when all stakeholders stand to lose from a decision that appears to have been made to try and protect management only. By pushing PPG away again, we believe that Akzo management have guaranteed an unhappy ending for themselves – maybe not immediately, but eventually. The team has done nothing over the last three months to win investor respect and the stock will likely be severely punished if PPG walks, or if Akzo chooses an acquisition path itself as a means of defense. Not good for shareholders. The Americans are coming! Both PPG and Sherwin Williams want to expand in Europe – a fragmented market by North American standards. They are better buyers and integrators of businesses than Akzo. Over time, they will likely take share from a stand-alone Akzo – not good for Akzo employees and other local stakeholders, such as the Dutch treasury (lower tax revenues). If rebuffing PPG is not enough to incite a shareholder revolt, then the likely ensuing missed projections and market share loss will eventually raise the heat. Talking to PPG would give Akzo management an opportunity to dictate or influence terms as they relate to themselves and other stakeholders – rebuffing PPG is likely to start the company on one of a couple of paths that both likely lead to an end for the Akzo team. We believe that an Akzo/PPG deal is in everyone’s interest and common-sense will prevail. 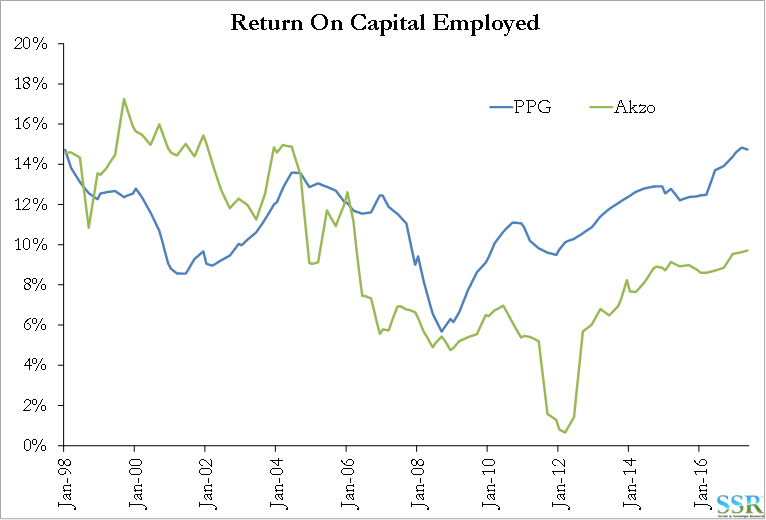 We like Akzo and PPG on this basis. Akzo has meaningful downside with no deal. In what is now 35 years involved in, consulting to, and covering the chemical industry we have rarely seen such misplaced arrogance and optimism than the approach Akzo is taking with PPG. The company is showing a complete lack of understanding of how industries evolve as well as what its future will look like if it does not properly entertain the offer that PPG is making. Every stakeholder in Akzo should be pushing for this dialogue to move forward. Shareholders clearly want the two companies to discuss the deal and engage in proper due diligence. While there may be lay-offs with the PPG deal, we believe that job losses will ultimately be much greater without the deal. 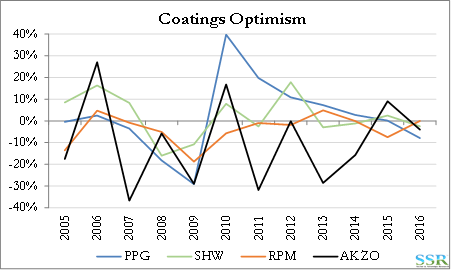 Akzo is a weak player in a consolidating market where PPG and Sherwin Williams are dominant – on a stand-alone basis we believe that Akzo will lose market share to its much savvier competition. Akzo management can negotiate on its own behalf in a collaborative deal – in a hostile deal, if they lose, they will unlikely retain any role. On a go-it-alone basis, as they lose market share and continue to underperform they will ultimately all lose their jobs, even if the Dutch system is slow. Akzo is a serial optimist and the worst in the group. 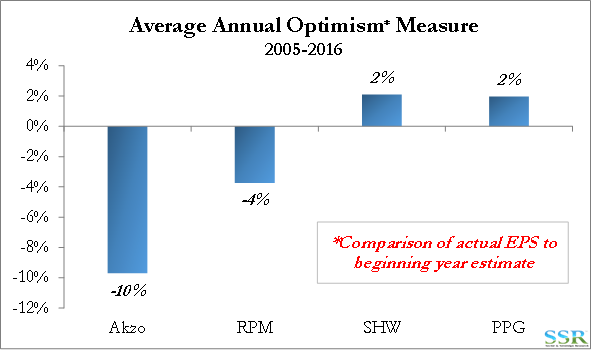 We define optimism as a consistent over-estimation of earnings potential – see prior work for more definition. In Exhibit 1 we show the annual average measure – in Exhibit 2 we show the 12-year history. Optimists tend to believe that their company is better, or more competitive, or in a better environment than actual. Consequently, they tend to misallocate capital and drive lower and lower returns – in Exhibit 3 we show the performance of the most and least optimistic companies in our US universe. Few believed the projections made by Akzo at the meeting, and we understand from those present that the body language of management suggested that they appeared unconvinced themselves. Akzo shows all the signs of a poorly run company with a management team that lacks the “self-awareness” required to fix it. Their retorts to PPG’s approach only serve to confirm that the strategies that have failed the company in the past will not only continue but will likely be pushed even harder. Akzo is already losing to its larger competitors, PPG and Sherwin Williams, both of whom have their sights firmly set on expanding outside the US in decorative paint. Both companies are more profitable than Akzo, both generate more cash, both have better paint production and distribution models and both are more aggressive and appear more organized. Europe is very fertile ground as the market remains quite fragmented. 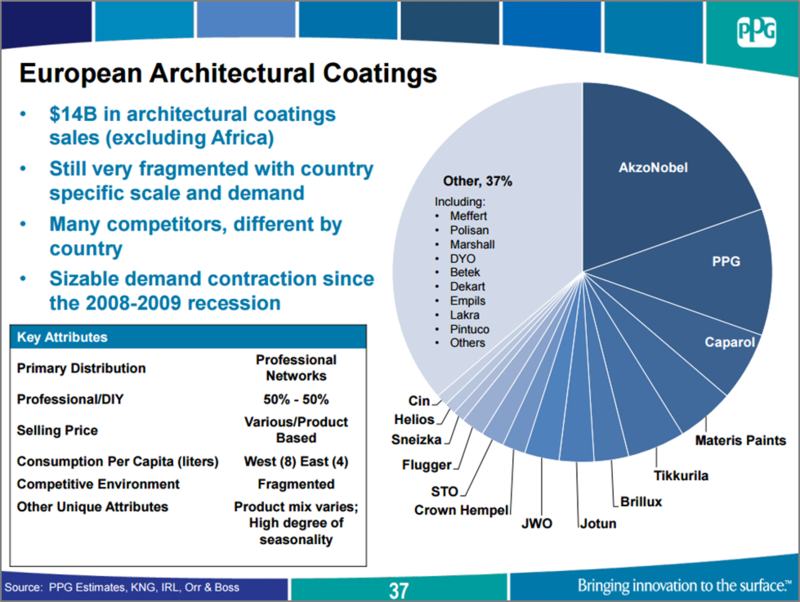 If PPG fails with Akzo, we would expect PPG to go after other targets – Exhibit 5 is a PPG slide from May 2014. Once Sherwin Williams has the Valspar integration under its belt we would expect the company to expand in Europe also. None of this will be good for Akzo, as the company clearly does not have the same “acquire, integrate and grow” skill-set that both PPG and SHW have shown consistently. We believe that Akzo on a go-it alone basis will lose share in Europe to growing global competition with better business models and the ability to offer better customer value. This will lead to further underperformance as a company and as a stock – resulting in restructuring moves that will ultimately cut jobs. Eastman’s push in PET in the 1990s – chasing growth, but failing to recognize that there were no barriers to entry and EMN did not have any “special sauce”. Dow Chemicals’ decades long overestimation of the value of its technology and how much share Dow could gain through integration and technology– resulting in overpayment for Union Carbide and Rohm and Haas. Nova; assuming that the business was special enough to warrant a premium to other appropriate proxies in the sector – waiting for the “right” price, while turning away good offers. DuPont – overestimating the value of the R&D pipeline – year after year. Cytec – a serial optimist (despite having a great growth business) the negative revisions were always a drag on multiple (relative to actual growth), setting Solvay up with a relative bargain. In our view Cytec would have commanded a much higher multiple given its growth had the company not consistently over-estimated the growth and disappointed. Optimism leads to shareholder value destruction as summarized in Exhibit 3. The very poor shareholder return that Akzo has generated is depicted in a very exaggerated form in Exhibit 6, which shows discretionary cash spend versus shareholder return. To be fair, very few chemical companies show a positive number in this analysis, but PPG is one of them, though most of this occurred post the chlor-alkali exit – Exhibit 7. Companies without a solid foundation and a good growth story tend to be forced into restructuring after restructuring as they try to right-size costs with weaker earnings.